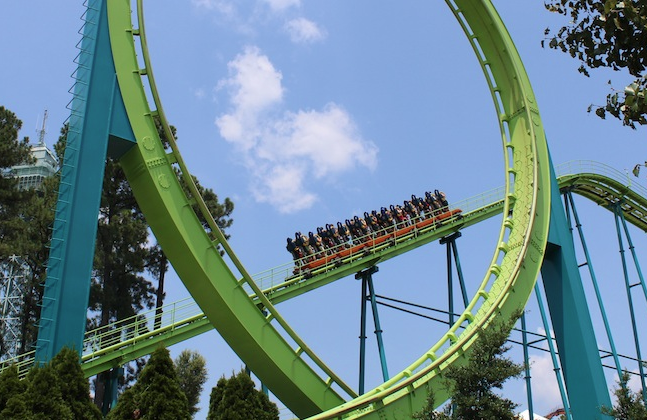 After giving 22 million rides over the past 29 years, Kings Dominion has announced the removal of the stand-up Shockwave roller coaster. The ride's final operating day will be August 9th, giving visitors just over a month to get their final rides in. Shockwave opened at Kings Dominion in 1986, the last in a trio of the coasters to open at the former Paramount Parks. Kings Island opened King Cobra in 1984 (removed in 2001) and Canada's Wonderland opened SkyRider in 1985, and removed it after last season ended. The rides were all designed by Togo and feature one vertical loop, a large helix and several small bunny hills among their elements. No official word yet on what will replace Shockwave, however the park hints at an expansion of the Candy Apple Grove area in the future. Full plans for 2016 will be revealed later this season.